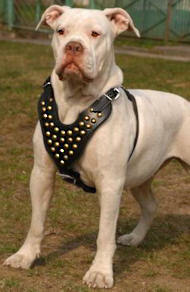 You need more strength and solidity from your martingale dog collar? You want your doggy to stand out in splendor with two chains on its neck? 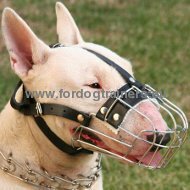 The problem is that two chains often get twisted and tangled and thus, martingale or choke dog collar doesn't work properly. Is there any solution for this problem? Yes, and this is our Two-in-One Chain Martingale Collar! Look attentively at the pictures of this dog product. Do you think two shiny steel chains are just put next to each other? They are welded together, and this eliminates problems with tangling and twisting. 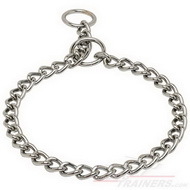 The chains are made of stainless steel, so this luxurious dog accessory will not rust or corrode. Check the originality of the product – a metal label with a red tug proves this Stainless Martingale Dog Collar is really produced by famous Herm Sprenger. As to the sizes of the collar, you will find more details in the sizing chart. The width of the double chain collar is 20 mm (¾ inch). Th links' diameter is 3 mm (1/9 inch). The weight of our Super solid Martingale is from 166 g to 257 g (5.8 oz to 9 oz) depending on its size. 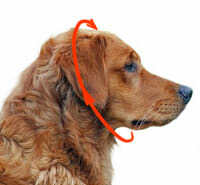 It is easy to determine the size of the collar you need for your pet – measure its neck circumference and add 2-3 inches. Please, mention that this Two-in-One Martingale Collar is not intended for daily use, so put it on your dog only for training sessions, thus caring not only about your furry friend's obedience, but also for its health!